Click the button below to add the Refurbished Optoma HD142X Full HD 1080p 3D Home Entertainment Projector (2017 Model) to your wish list. Convenient and easy to setup the bright and versatile HD142X boasts Amazing color technology and conforms to REC.709 delivering accurate true to life color reproduction. This small projector is ideal for watching live sport, TV shows or movies any time of day on a big screen. 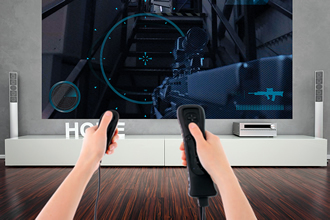 You can even connect your gaming console and play games on it with its low input latency. An integrated speaker provides you with great sound and two HDMI inputs enables an easy setup. Perfect for connecting a laptop, PC, Blu-ray player, media streamer or gaming console. You can even turn it into a smart projector by connecting an HDMI dongle like the HDCast Pro (sold separately), Google Chromecast™, Amazon Fire TV or Apple TV™ to play games, stream videos and share photos on a big screen, in the comfort of your own home. Weighing less than 5.5lbs you can take it round to a friend’s house with the optional carry bag for a sports event, movie night or games marathon for the best big screen experience anywhere with a flat surface. There may be instances when the projector is left running when not in use. To help save energy, the "Auto Power Off" feature automatically turns off the projector after a set period of time, if it is not being used. 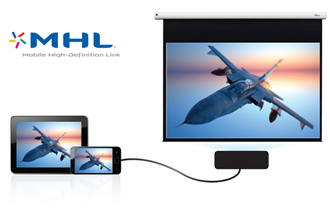 Turn your projector into a smart display by connecting the HDCast Pro (sold separately) and stream videos, music and share photos on the big screen using your smartphone or tablet. Optoma projectors can display true 3D content from almost any 3D source, including 3D Blu-ray players, 3D broadcasting and the latest generation gaming consoles. Gaming mode optimises your projector for lightning response times, maximum contrast and vivid colors to capture every detail - leaving you time to focus on winning. 3D Support Full 3D - The 3D features of Optoma projectors can only be used with compatible 3D content. Typical applications include use with 3D educational or 3D design and modeling systems. 3D TV broadcast systems, (SKY in the UK), Blu-ray 3D™ and 3D games from the Sony® PS3 or Microsoft® Xbox 360 are now supported as part of the HDMI v1.4a specification. decent price but an awesome hd projector! I upgraded my projector from lower level Chinese brand(around $250) to this Optoma HD 142. The differences are day and night! Smaller, lighter, way more brighter, of course the detail vivid colour!!! Although there are more high end projectors out there this one is perfect for me. Great price , awesome picture plus friendly customer service!